Bush receives a standing ovation. Watching the president [Obama] throw out the ceremonial first pitch at the Nats game yesterday (which you can watch on the homepage), I couldn't help but think of President Bush's first turn at that task. Yankee Stadium in October of 2001, under much different circumstances. As Bush chatted with the Yanks in their clubhouse before the game, he was reportedly told by Derek Jeter that, if he missed the plate, he'd be booed — "United We Stand" or not. As you can see, though he was burdened with heavy body armor under his FDNY fleece, Bush didn't miss the plate. He fired a sinker in there for a belt-high strike. Just sayin'. Me: If you watch Obama throw a baseball, and you are a guy who has personally played catch since you were a kid, you won't be impressed. To put it mildly. Below: President Bush at Yankee Stadium shortly after 9/11. Impressive. To put it mildly. "if David Axelrod had negotiated the bizarre angle (there is no other word for it, if you’re a baseball-watching fan) used to showcase President Barack Obama’s ceremonial “first pitch.” I have never seen a president throw a pitch, before, where the angle left out the catcher at the plate." She has produced a brilliant comparison of Obama and Bush, not only in throwing ability, but more importantly in their style (and modesty). Her post is definitely worth reading, as is her link to Andy McCarthy. Obama's pitch did not make it all the way to the plate. . . The guy throws like a girl. I'm sorry. He throws like a girl, he had a girlie toss. The video he posts substantiates his point. Further down Rush's post you can compare President Bush's 2001 World Series toss. Is throwing ability small potatoes? Yes. What's significant are the larger points made by the Anchoress and McCarthy. The media will stand on its head (and orchestrate camera angles and commentary as well), to make this president look good. Blogger "The Anchoress" discovered and linked this photo essay of President Bush created and narrated by TIME magazine photographers Brooks Kraft and Christopher Morris. The pair reflect on the eight years they spent covering George W. Bush. This heartwarming tribute to our 43rd president features memorable and heartrending photos of Sept 11, 2001, the buildup to the war, and the president's visits to our wounded soldiers. President George W. Bush is a nice guy. But as the leader of the United States, and the leader of the free world, and the leader of the Republican party, he had a responsibility to answer his critics promptly and forcefully with fact, after fact, after fact. Instead he remained silent, and thereby let his enemies distort reality and control the historical narrative. President Bill Clinton did not make that mistake. He did the opposite. He went after his opponents constantly, even if it meant stretching or denying the truth. History has been kind to Clinton. President George W. Bush is a good, decent, honorable, humble man. One can disagree with him on this or that policy, but his fundamental decency remains. Click here for the interesting and revealing two-part video interview. The Anchoress says she was very touched by the President's genuineness and humility. European news outlets have for quite awhile reported a distorted view of Bush’s faith, and this interview is truly earth-shattering news for them. -- Update 11/8/08 - In addition, see Jim Towey, "Why I'll Miss President Bush" - "The president's true character rendered his media image pure caricature." Frank J. Gaffney Jr. spells out the unraveling of Bush's policies: appeasing North Korea, a Palestinian State no matter what, closing Gitmo, and farewell to sovereignty. Seriously sad... historically sad. Kristol lists reasons. I think he may be right. As much as I appreciate the many virtues of George W. Bush, I think Peggy Noonan's assessment sadly accurate. 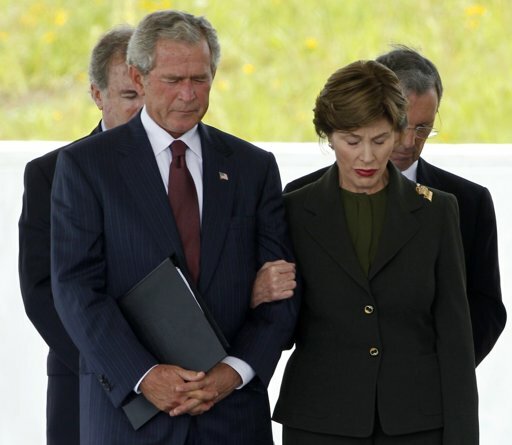 What President Bush is doing, and has been doing for some time, is sundering a great political coalition. This is sad, and it holds implications not only for one political party but for the American future. Joel Belz of World Magazine sets the record straight. A still more definitive answer may be found in Norman Podheretz's "Who is Lying About Iraq?" Update: 1/12/06 - See the article Bush Understated Saddam's Threat which discusses the treasure trove of materials found in Iraq (over 2 million items! ), including the names of 8,000 or more terrorists who trained in Iraq from 1999-2002 under Saddam. This article in turn builds on Stephen Hayes' 1/16/2006 piece that appeared in the Weekly Standard. Only 2% of the materials have so far been translated but they are amazing and totally discredit the accusations that President Bush lied about Saddam's threat.